West Michigan Pursuit travelled to Charlotte, Clio and West Virginia this past weekend. Kellen Weckesser and Quinten Cassiday travelled to West Virginia to compete in the Winter Throne tournament. Weckesser entered the 10U, 62 lb division and finished 2nd. Cassiday entered the 10U, 75 lb division and went undefeated, claiming a Championship title. 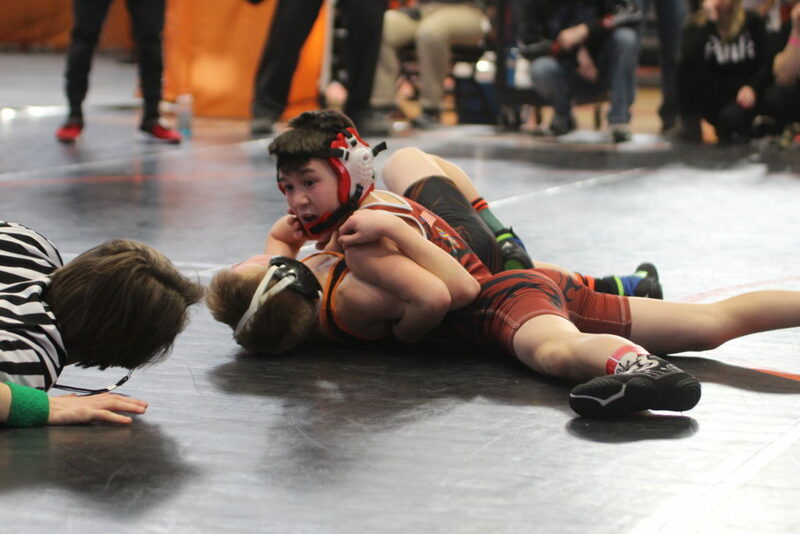 WMP had nine grapplers travel to Clio for the Northeast Regions’ Greight tournament. 75 lb Kamden Witte, 11/12 age group finished 3rd. 54 lb Carter Giles, 9/10 age group; 85 lb Tyler Parmeter, 9/10 age group and 55 lb Blake Werkema, 7/8 age group finished 2nd. Greights Champions are 69 lb Evan Andrews, 9/10 age group; 90 lb Blake Peasley, 11/12 age group and 75 lb Josh Vasquez, 11/12 age group. The rest of the team travelled to the Central Region in Charlotte. 80 lb Alex Russo, 11/12 age group finished 4th. 58 lb Dylan Russo, 7/8 age group finished 3rd. 90/95 lb Xavier Carpentier, 11/12 age group; 90 lb Ayden McClurken, 11/12 age group and 64 lb Desmond Smith, 7/8 age group all finished 2nd. Charlotte Champions are 58 lb Tatianna Castillo, 7/8 age group; 80 lb Harper Cheng, 11/12 age group; 52 lb Brody Compau, 7/8 age group and 75 lb Luke Egan, 11/12 age group. “These kids are proving to have success whether traveling nationally or locally. Each week, they continue to impress me with their wrestling and their sportsmanship,” said Head Coach Dave Andrus.